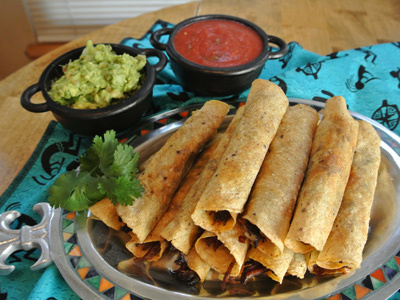 If these flautas look familiar it’s because they are very similar to my Barbacoa Taquitos. The difference between flautas and taquitos are the type of tortillas. Flautas are made with flour tortillas where as taquitos are made with corn tortillas. Corn tortillas are my first love but sometimes I make flautas to please my hubby. The thing about making flautas is cooking the tortilla to that perfect crispness. If overcooked they will be overly crunchy and taste like a cracker. And the filling should be somewhat dry so that the tortilla won’t become soggy. I went back to an old favorite, a seasoned slow cooked chuck roast flavored with Frontera’s Barbacoa sauce. Chile de Arbol salsa and Molcajete Guacamole are the perfect condiments to dip your flautas in. Enjoy! This might be one of the tastiest tacos ever! They were so good I can’t wait to make them again. This Mole sauce has so many flavors to awaken the taste buds including dried chiles, spices and dark chocolate. The pulled pork was the star of this taco so there was no need for a lot of toppings. A fresh Pico salsa with crumbled Queso Fresco is all you need. Last fall Joe and I went to Old Settlers Day which is a local festival here in Olathe. The streets are blocked off for a few days as people gather for concerts, arts and crafts, an old car show and a parade. As we were walking through the streets checking out the arts and crafts, we saw a lot of folks eating tacos that caught our eye. I could tell that they were made with flour tortillas but they were crisp and browned on the outside. As we neared the food vendors we found a group of boy scouts selling “Pan Fried Tacos”. I watched as they prepared them with taco meat and then placed them in a skillet with a little bit of oil to crisp and brown them, first on one side, then the other. Before they handed them over they topped them with shredded lettuce, chopped onion, tomato and grated cheese. I had to try one and it was love at first bite! Flour tortillas aren’t usually my first choice for tacos however the pan fried method gives the tortillas a crisp and crunchy texture which also makes them taste so good. With one rotisserie chicken you can make a variety of meals. I was able to make a mound of Ancho Chicken Nachos with the dark meat and still have leftover breast meat to use for another dish. I chopped the breast meat into little cubes and combined it with a green chile sauce to make a filling for Verde Chicken Taquitos. My love of taquitos has no bounds! I love biting into those crisp corn tortillas with savory fillings and oozing cheese. They’re the ultimate fun food you eat with your fingers, but when you dip them into a creamy queso, spicy salsa or fresh guacamole you add on a whole nother dimension. Whether you mix or match is up to you, but you can’t go wrong with any of these flavors. I had 3 cups of leftover chicken which made 2 dozen taquitos. Next time I may use the whole chicken to make a batch for the freezer.